Leadership Archives - Don Phin Esq. Triage – ask the critical questions at the right time. Break the problem down into manageable pieces. Balance the inside and outside views. Balance underacting and over reacting. Look for the clashing casual forces affecting each problem. 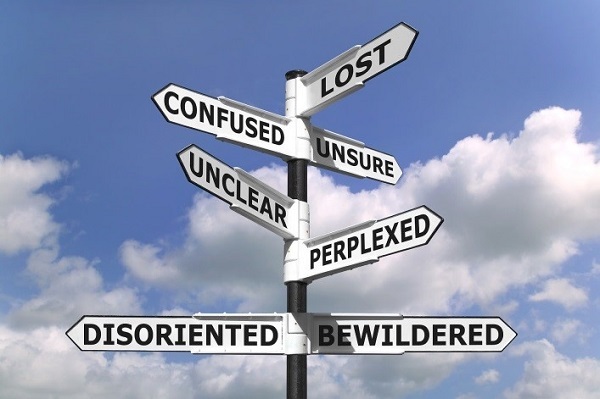 Try to distinguish the many degrees of doubt as a problem permits. Strike the balance between under and over confidence and prudence and decisiveness. Look for the errors behind the mistakes but know of rear-view mirror hindsight bias. Bring out the best in others and allow them to bring out the best in you. Master the error – riding a bicycle. Learning requires doing and feedback. There is wisdom in each one of these suggestions that applies to everything from searching for opportunities to managing risk. It’s a great formula for tackling many problems. Side note: If you’re interested in a free PDF copy of the book I wrote Stop Making Mitsakes, please email to don@donphin.com. I can’t believe she is going to leave me. I can’t believe he cheated on me. I feel exhausted and depressed. I can’t believe I have cancer. My mother just passed away. My kid is in the hospital. My kid just got diagnosed with ADD. I’m going to lose my house. I can’t believe lost all my money in that investment. I don’t know if it’s worth living anymore. These are the endless loop conversations that nobody else hears and it affects the ability to listen, concentrate, produce, engage, or feel good about work. Heck, I’ve been there in my life. This is about them…it’s not about you. And there is nothing you can do as an outsider to their conversation to “control” it. When you have empathy for people you connect at the heart level. Your caring for them is as a person, not as an employee. Within boundaries you ask how you can help. The best thing you can do is go for a walk with them and just listen… or give them something positive to work on…or a few days off to get straightened out. When the time is right you can have a dialogue with them. This is not a conversation or sharing of opinions. It is deeper conversation that gets to the essence of the problem. You don’t have to be a psychiatrist to be able to do it either. Just the continued awareness that there is always something else going on will help to better empathize with employees…as well as yourself. So let’s give everybody a break! 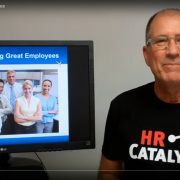 We had such a good response to my post on 10 HR Ideas that I decided to shoot a quick video sharing 10 ideas for hiring great employees. What would you add to the list? Which idea will you try? Thanks for your patience. I appreciate those of you who let me know I needed to do some editing…and fast! I love creativity. Disruption. Differentiation. In fact, I’m going to be the MC for the next DisruptHR meeting in San Diego. 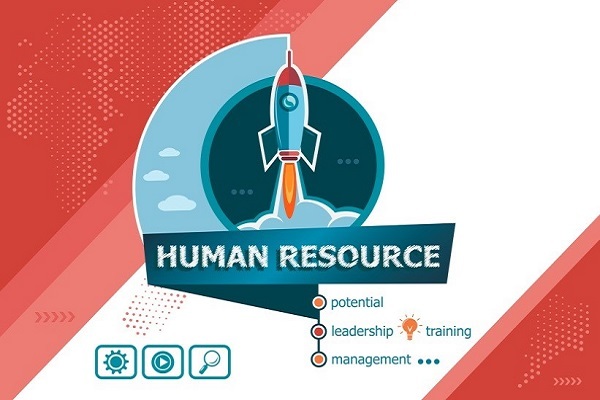 HR has a great opportunity to break past the status quo and to test new theories, strategies and tools. Here’s 10 ideas I came up with. What would you add to the list? Do tell! 1. Request every job application to submit a joke with their resume. I am serious about this. If they don’t do so they can’t follow instructions and you don’t hire them. Then there are those who will provide jokes that put them on the do not hire pile immediately. For most everyone else, you at least have a laugh while going through that stack of resumes and you will learn a little bit more about the candidate. 2. Create an employee referral system that works. Most employee referral systems don’t work for two good reasons: there’s not enough “juice” in them and it comes with little support. You have to make it easy for employees to refer candidates with a one page document they can hand them or a link they can drive them to. Then put some financial “juice” in the system that gets them past the fear of referring someone. I would consider as much as 10% of that employers first year salary, which is far less than you would pay a recruiter or temp firm. Parcel the payments out quarterly over the year if the employee remains on board. 3. Do group interviews with final candidates. I like seeing how people work in a team dynamic. Have three potential coworkers interview the final three candidates… all at once. Each employee will ask each candidate three questions. You are not just focusing on the answers but how the candidates treat each other while going through that process. Will they through somebody under the bus? Will they raise their voice and disagree? The best thing you can do is have fun sitting back and watching it unfold. It will tell you how they will treat future co-workers. As with any of these ideas just test it once. See how it works. Then improve it from there. 4. Ask my favorite interview question – what felt unfair to you at your last job? And then drill into the answers. How they respond will indicate how they will deal with something that feels unfair working for you. Which is guaranteed to happen. I will go through a candidate’s entire history with that question. Doing so has eliminated many a candidate. And… don’t forget to ask what they were most excited about in previous jobs. 5. Create a social media committee. Millennial’s will be great in this role. Provide them with some simple rules to follow and then let them do their thing. They can help your employer brand on Glassdoor, Indeed, your hiring page, Facebook page and more! 6. Ask your managers to take on a very simple challenge: for the next 20 workdays, beginning on a Monday, they are required to show at least one employee they manage that they care about them. You can discuss their family, upcoming vacation, or job concerns. Provide the manager a simple form where they can write down each day who they spoke to and what they did to show they care. Then he asked them to turn it in after 20 days and have a discussion with them about what they learned in the process. 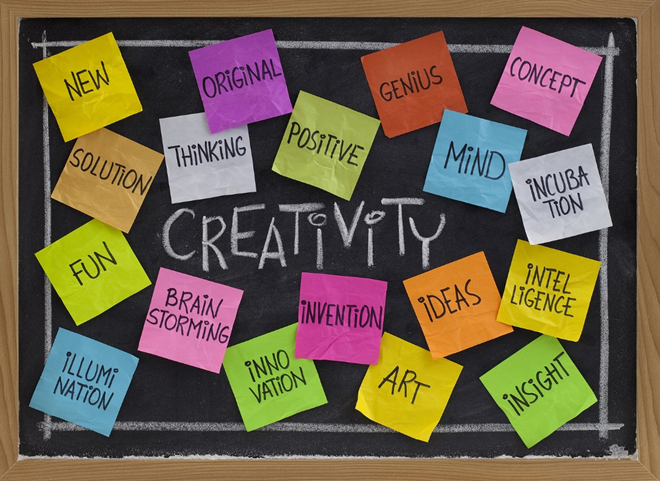 What great ideas can be shared with other managers? Make sure you commit to the exercise as well. Perhaps have fun prizes along the way. 7. Create an art wall. You can decorate it with pictures and paintings from local artists, your employees, and their kids. It will breathe creativity into the environment. Besides, you can’t be funked out very long looking at kids art. 8. Have a Red Nose Day. While the official date is May 25, the better one is any day you choose. Red noses are cheap on Amazon and it will generate many laughs. 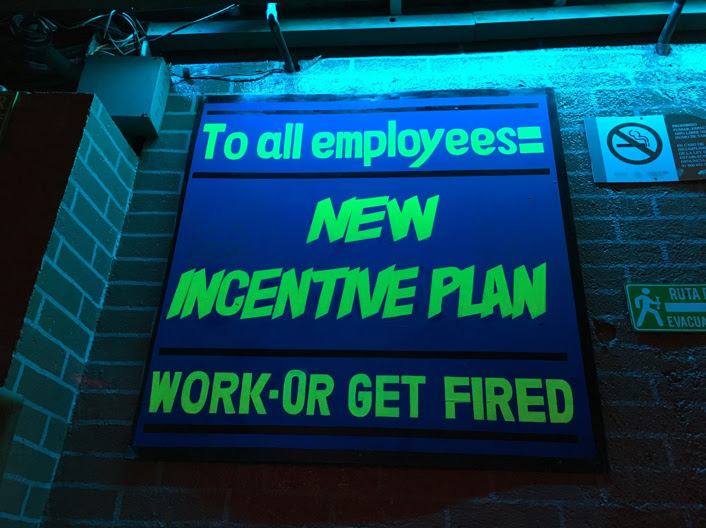 Give the employees a few to take home too. I find it’s very difficult to take yourself or anyone else seriously while wearing a red nose. Make sure to gets lots of selfies to post! 9. Create a quiet hour. Preferably early in the morning when people are at the sharpest so they can focus on the most important tasks. Prohibit “stopping by”, emailing or otherwise interrupting the quiet unless it is an urgent and important matter. 10. Make fun T-shirts for your employees. Let them get involved in the design. Have a contest. Employees will design a shirt they want to wear outside of the workplace. 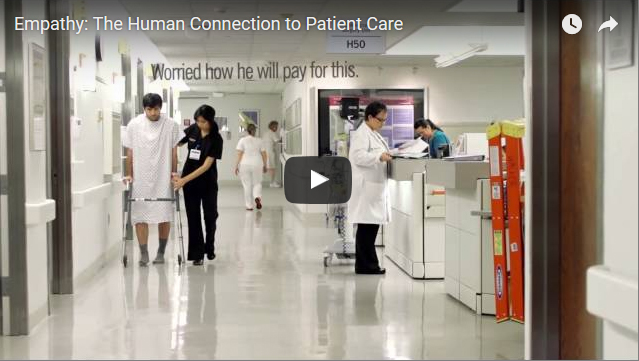 This is a low-cost way of engaging and branding your workforce. Those are just 10 of my Great HR ideas. What are a few of yours? What have you done that is cool, disruptive or different? Please share and I will accumulate the responses. Once I have received 100 combined I will send that document to all contributors. You want to be on that list. PS this list is derived from the Great HR program. Plenty of more where they came from…and now we will generate even more. I must admit – I got the idea for this index card after listening to a podcast with Howard Pollack, a professor from University of Chicago, who said that everything you needed to know about building your financial wealth can be written on an index card. The card went viral and he followed up with a book to explain it. So, I challenged myself to figure out what I would put on an index card for managing employees after 30 years being in the field. Here’s my index card. Spend the effort required to hire winners. Have a great onboarding process. Have clarity about performance results. Make sure your systems support performance. Let go of poor performers. Give people permission to think. Train more than the competition. Create an engaging work environment. Get your compliance act together. Now let me try to briefly explain each one. I dig in further on the video here. Spend the effort required to hire winners- Unfortunately most managers few hiring as something to get over with. Make sure your managers understand hiring great employees is the most important thing they will ever do. Have a great onboarding process- I’m amazed by how poorly some employees begin their work experience. Great employers have a well-oiled onboarding process which gets newbies producing asap. Their first day, week and month should be carefully planned. Don’t wing it when it comes to onboarding. Have clarity about performance results- Perhaps the greatest problem with performance management is the lack of clarity about what it means to perform. There’s a simple question you can ask an employee: how would you know if you’re doing your job well without having to ask me, or without me having to tell you? If their answer is not spot on you’ve done a poor job of managing their performance. Make sure your systems support performance- It’s not just about performance clarity, it’s also about supporting performance. Dr. W. Edwards Deming opined that 9 out of 10 employees want to do a good job every day. It’s the system that allows them to do so. This system starts in the hiring process by making sure you don’t hire misfits. Often the “system” is that person’s immediate manager. Half of all managers manage better than the other half. What training are your managers getting? Let go of poor performers… and managers- Here’s a question for you – do you have anybody working for you that if they quit you would be more relieved than upset? If so, why are they still there? Is it the bosses kid? Do they have photos? What is it? Keeping poor performers sends a message to everyone else that mediocrity… or even worse… is acceptable. Managers are often the source of employee performance problems. Sometimes it’s time to let them go too. Give people permission to think- None of us is as smart as all of us. The whole idea of controlling a business from the top down is out of step with today’s reality. When you give people permission to think you allow them to focus on work they know best, provide suggestions, and look for new business opportunities. I encourage employers to have mandatory suggestion meetings to drive past the fear involved of people actually thinking! Train more than the competition- George Gilder reminds us we are in a knowledge economy. In a knowledge economy, it is education that offers the greatest leverage for both employee and company. Not surprisingly, the most successful companies out train their competition. Given all of today’s online offerings, the out of pocket cost of training is minimal compared to the employee’s time involved in it. If you want to obtain a return on investment with training examine how it has actually improved performance. Create an engaging work environment- Your work environment is always communicating. It is never not communicating. What story does your environment communicate? Ask yourself whether the work environment is engaging or not? I encourage employers to fill their walls with vision statements, success stories, employee inspired artwork, powerful quotes and more. Allow your employees permission to decorate their work areas as the result fits within reasonable guidelines. Reward great work- As stated in Barber’s Book of 1000 Proverbs, “The greatest benefit is the one last remembered.” In my experience when we run 75 mph we focus on those aspects of an employee’s performance that drive us nuts and ignore their great work …because that’s what we expect from them. This is a big mistake and one of the main reasons employees leave companies. While I’m not a big fan of rewarding people simply for showing up, I am big fan of rewarding great work as soon as possible! Get your compliance act together- Last, employee lawsuits are ridiculously expensive but most employers don’t appreciate the risk until they have suffered it. Do yourself a big favor and if don’t already have access to ThinkHR from your broker or payroll company then get it from me! I’ll offer you a deal that simply too good to refuse. There are my 10 rules. 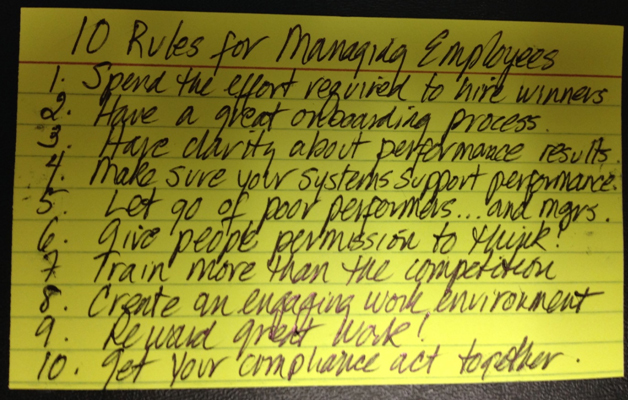 What would add or take away from your 10 Rules for Managing Employees index card list? Note I also did a video about this list you can watch here. If you like it please share with a friend or provide a comment. Thanks!